So, today we bring a rumor to you courtesy of our friend Mr. EPCOT, who just happens to live by Universal Orlando Resort. According to him, there were pyro tests happening over Islands of Adventure last night. He says he saw an occasional white flash, which he initially believed were just leftover shells from Universal Cinematic Spectacular. But he assures us that after closer inspection, the flashes were definitely coming from closer to Islands of Adventure. Now, what can this mean? Well, by all accounts, Universal Cinematic Spectacular has been a success at the Studios park, so much so, that Universal is actively redesigning its waterfront in order to offer more viewing space in the Central Park area, as we reported earlier this month. 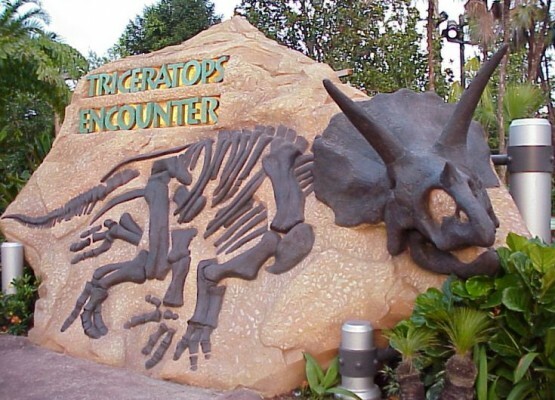 Maybe Universal is now intending to do the same for the IoA park? It would make sense, and the properties there could really make one heck of a nightshow. Another hypothesis I have about it could be a NYE fireworks spectacular for the park. 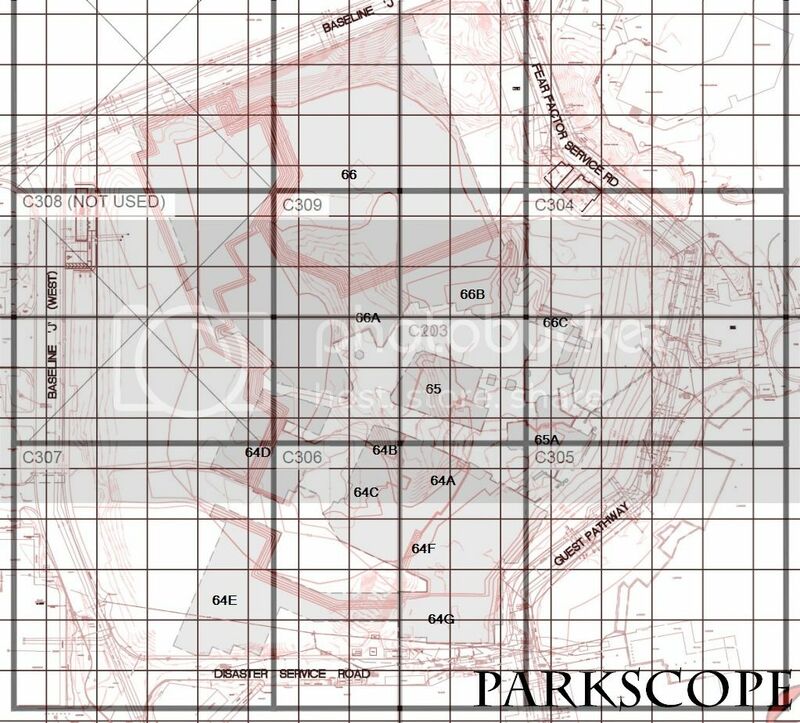 As always, make sure you follow @Parkscope, and we'll make sure to keep you updated on developments. While I'm here writing, lets talk. Disney is pushing the Disney Parks Blog into new territory with a new viral marketing campaign. They've not come out and said it using hashtags or Tumblrs, but this is a use of WDI's ultra-light AA concept. Think of it as Lucky the Dragon in the Sky. And that's what it is. From what us at Parkscope have been hearing over the months and weeks, this is going to be a very, very limited use of this technology. We don't have specifics, but the understanding is that either after the press event this week or after this holiday, the AA Ultra-Light will be sent back to California. Plans change, concepts grow and shrink, things break. So take what we're saying, and others more optimistic online, with a grain of salt. 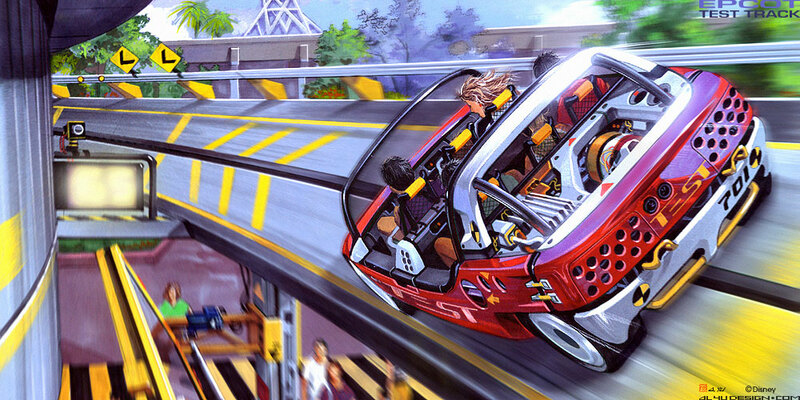 Test Track Teaser Mural; 1996. Photo from Intercot. We all have the one. Some of us it was the Millennium Celebration construction. Others Mission:Space or Mr Toad. Maybe it was the Asia or Expedition Everest expansions at Animal Kingdom? Heck, it could even go as far back as UseNet trip reports. But for me, it was Test Track. This ride captivated my twelve year-old imagination like none other. What was in the building? Well, I KNEW what was inside, World of Motion was one of the few rides I rode when I was really little (the other was Small World, my parents tricked me onto that to see the fountains in the old load area). But there was something magical and mystical about the preview center, which teased the fastest ride, the longest ride, the coolest ride at Epcot. The dissected model of the attraction teased the sights and sounds inside. But lots of people have anticipated rides at theme parks over the years (see: Haunted Mansion). 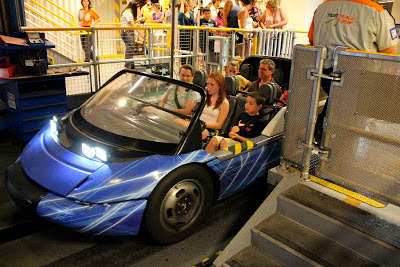 But Test Track co-aligned with my blossoming interest in the Internet. Sites like Imagineering.org and the Dreamfinder (now known as Jim Hill) posted updates and rumors. I found DisBoards and WDWMagic who CM insight into the problems with debuting the attraction. And when I went in 1999 to ride for the first time, it was an amazing experience. I still remember it to this day; I rode with my friend using the brand new, "cut through the bushes to the left", single rider line. We got in and out in 30 minutes. We should have rode again, but we didn't know how long the rest of our party would take in the regular line (hint: long time). Also, remember, this is when FastPass was still an Animal Kingdom only test! 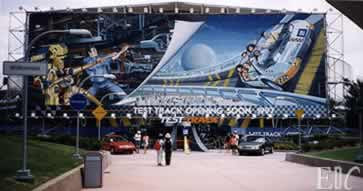 Test Track was my first exposure to the internet Disney community. So while Test Track gets pulled through the mud for continuing the decline of Future World and Epcot (some deserved, some not), those comments have always hit me hard. I understood that black drapes, 'Mini Black Lake', and cut out trees are horrible set design. Power tools are not instruments. And a ride system that can't work in the rain and then put info Florida is not very bright. 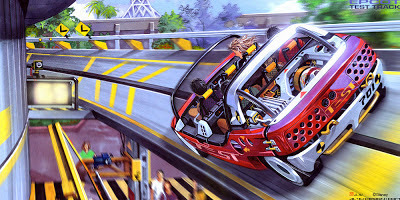 But I still looked forward to my ride, every few years, on Test Track. This past February was my last trip on Test Track 1.0. The wallpaper was peeling in the pre-show rooms. Bill McKim was not HD, but was on plasma screens. The whole ride was in rough shape, but every few cars a striking blue one would pass. The blue car hinted at the future of Test Track. Now I repeat the cycle, refreshing my iPhone while getting a hair cut, to read the impressions of my friends on twitter. I find a video uploaded from an iPhone to YouTube using park-wide WiFi and watch it with a friend. I view photos of the queue on Instagram. Disney fans are a very fickle, diverse bunch. But when something new opens, we all unite and experience the awe of it. The technology has changed, but not the community. As I mentioned in Part 1, I spent the first part of Day 1 in Walt Disney World, but I made my triumphant return to Universal Orlando that afternoon. The night before, I ordered my Annual Pass online. I picked it up quickly and seamlessly at an Islands of Adventure ticketing kiosk. I then purchased my Rush of Fear pass for Halloween Horror Nights at an Islands of Adventure ticket booth with the Annual Passholder discount. I gleefully ran into Islands of Adventure with the Wizarding World of Harry Potter as my destination. Potter deserves its own trip report, so I'll save it for Part 3. After Potter, I walked to Spider-Man. Along the way, I got lost in Toon Lagoon, and I am embarrassed to say that this always seems to happen. Something about the layout of Toon Lagoon gets me turned around. The Amazing Adventures of Spider-Man received a well-done refurb. Many people consider it one of the best theme park attractions of all time, and this refurb will only improve its case. The new film is very crisp and will keep this attraction relevant when Transformers opens in Summer 2013. My one criticism is the photo-op they have added in the queue, but it can be skipped, and more importantly, it does fit. 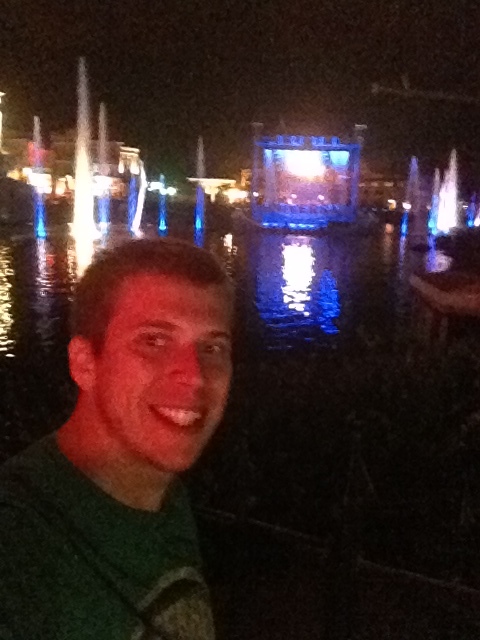 After Spider-Man, I headed over to Universal Studios for Halloween Horror Nights. The weather was looking very ominous as I waited in line for the gates to open. I got in the park and met up with friends. We had just got under the overhang of the Gothic queue when the sky fell. It rained and it rained, the deluge...When we got out of Gothic, it was still POURING. We made a bee-line for Finnegans and spent most of the night there when it rained. Gothic was considered by most to be the best house of the year. I do not agree with that, but I was a HHN virgin. During a break in the rain, we ran over to House of Horrors which was cool. After House of Horrors, we did Alice Cooper which was located near the exit of House of Horrors. The best part of Alice Cooper was the stripper room. It then rained some more, so we spent some time in Spongebob Storepants which is a home run as far as stores go. Later in the night, after watching some football in Finnegans during even more rain, we headed over to Fear Factor Stadium for Bill and Ted's Excellent Halloween Adventure. I had no idea what to expect, and I absolutely LOVED it! It reminded me of how I used to feel in Pleasure Island. I love adult humor in a theme park setting. The week after I got home, the show was involved in controversy when a conservative blogger complained about a segment involving Barack Obama and Mitt Romney. The segment was harmless. Some people just have no sense of humor, sadly. For those who did not get to attend the show, it is a parody of pop culture from the past year. Among other things, it featured The Hunger Games (with a very attractive Katniss), Merida from Brave, Snow White, Mad Men, the presidential race, and a Mayan ritual. The show featured scantily clad women (and men), pyrotechnics, singing, rapping, and dancing. Excellent! To cap off the night, we did Dead End which was and remains my favorite house of the year. 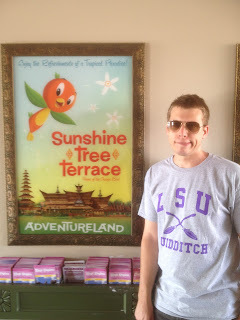 After an ill-advised trip to Gainesville, I was eager to get back to Universal on Sunday. After dropping off a friend at MCO, Taylor and I picked up Sean (Parkscope) and headed to UOR. Taylor dropped us off and Sean and I headed to Islands of Adventure to meet up with Nick (Mr. X) and his lovely wife. 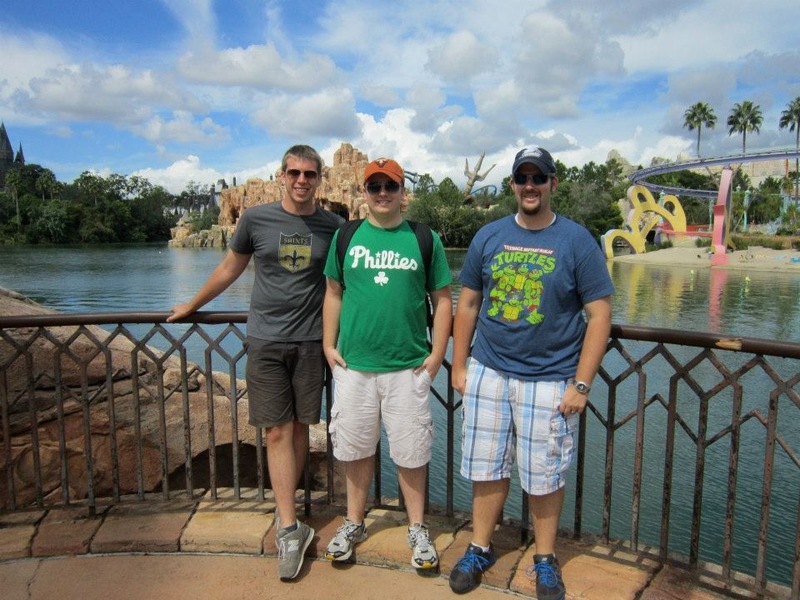 While waiting for Nick, Sean and I rode Hulk, Forbidden Journey, and Hippogriff. We caught up with Nick and his wife in Hogsmeade. We did a group ride on Forbidden Journey and Spidey. While in the Spidey queue we talked about how many kids we have seen at UOR and how the resort gets a bad rap as not being "kid friendly." We waited in an extended queue of Spidey which I was not aware existed. We bid Nick and his wife farewell in Port of Entry, and we headed over to Universal Studios where I rode Hollywood Rip Ride Rockit for the first time. We waited longer for it than it is worth, but it was not as bad or as good as I was expecting. The best part of the attraction is the lift hill which legitimately scared me. The Mummy had an unusually long wait. When we finally got to the loading area, we saw that they were only operating one side. We went again the next day and they were still only loading one side. Perhaps they had not planned for the crowds or the other side was broken, but both sides needed to be operating. Later in the day, we did the Horror Make-Up Show. It was my first time seeing the show, and I did not know what to expect. The show is very well done and funny. It was another thing that, like Bill and Ted, reminded me of being at Pleasure Island. The other day, I realized our host was Summer Aiello (Michael Aiello's wife.) She did a very good job, and she follows me on Twitter. Cool all around! 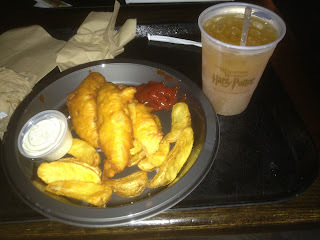 After Horror Make-Up, I think we headed to Islands of Adventure to eat at Three Broomsticks. After dinner, we took advantage of the special HHN walkway between IoA and USF. Along the way, we scoped out the area where the alleged Seuss expansion is set to take place (word online is that they are waiting to finish Transformers or Simpsons first.) We actually got into HHN earlier using this entrance. Before the crowds got terrible, Sean and I were able to do Walking Dead, House of Horrors, Alice Cooper, and Penn and Teller. When we got to Dead End, the crowds had gotten very thick. The crowds never let up from that point on. I never got to Silent Hill. Later in the night, we met up with Matt (Mr. EPCOT.) Together, we caught one last show of Bill and Ted and rode Despicable Me. Minion Mayhem is very well done and a superior replacement to Jimmy Neutron. I am very happy for Universal that they were able to make a family friendly movie of their own for once, and this should be a classic for all ages for years to come. After Minion Mayhem, we called it a night. Halloween Horror Nights is a ton of fun, but next year, they need to expand. With Jaws gone and Transformers blocking streets, the crowds were thick. I will return in the future just to see Bill and Ted. As I mentioned earlier, Dead End was my favorite house. I got a legitimate scare that made me jump in the very last room. My second favorite was House of Horrors. The use of strobe lights really messed me up. I did not care for Penn and Teller very much. Walking Dead was pretty cool as we got to do it basically alone. After Terminator, we headed over to IoA before Sean had to leave for the airport. We rode Cat in the Hat, Spidey, and Dragon Challenge. 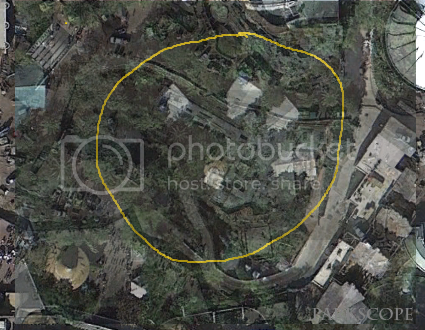 From Dragon Challenge, we were able to see construction of Hogsmeade Station which is coming in the expansion of the Wizarding World. 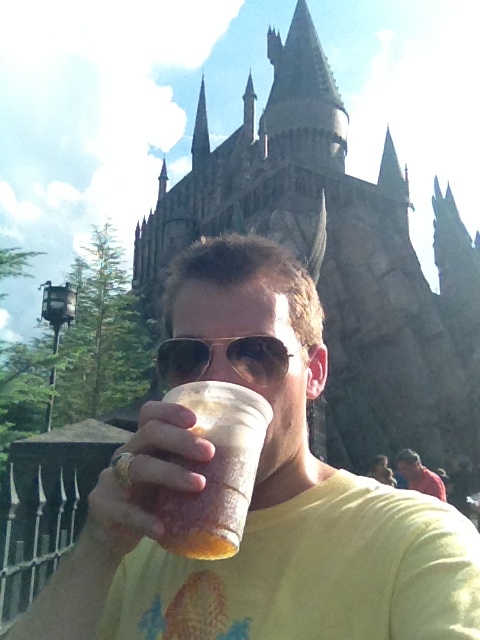 Sean and I both got Butterbeer, and we relaxed behind Three Broomsticks. The Three Broomsticks outdoor seating area is a great place to get away from the hustle and bustle of WWoHP. I bid Sean farewell and headed over to USF to catch Animal Actors. It is a very cute show, and it is something that is quite at home in a studios park. After the show, I watched Potter and Transformers construction from the Simpsons waterfront (which is now walled off.) I walked back over to IoA to get in one last round of Potter before it closed. I bought the souvenir Butterbeer mug and nursed its sweet nectar as I slowly walked to the exit. After IoA, I returned to USF for Cinematic Spectacular. While I waited for the show, I did Minion Mayhem one more time and bought a Minion plush for my girlfriend. I also walked around USF at dusk for the first time, and it is very pleasant (and very different from HHN!) I loitered along the London Waterfront for a bit, and then, I found a place to watch Cinespec around Central Park. The show is incredible and gave me goosebumps. 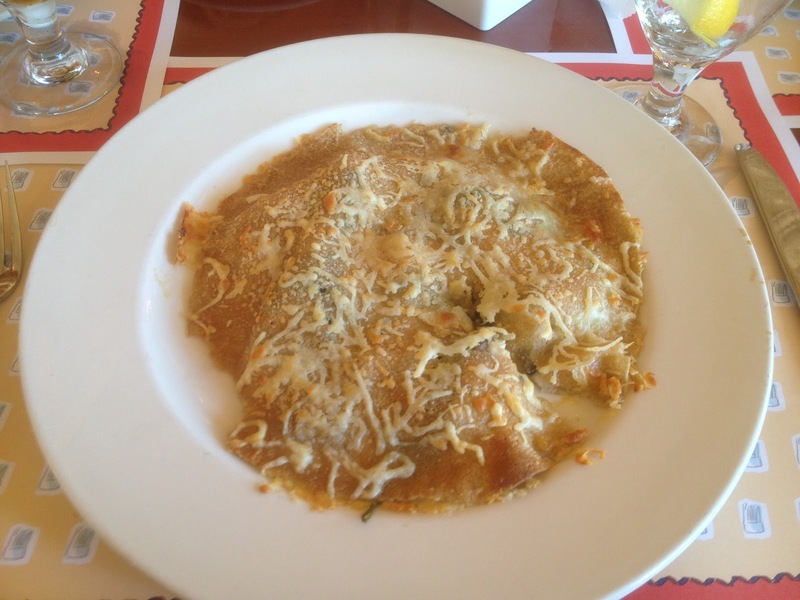 I will have to give a proper review in a separate post. The lasers seemed to add alot. I was very sad to leave Universal. That is latest I have ever stayed in a Universal park as they usually close early. The addition of Cinespec is a game changer in that it gets people to stay later and experience the ambiance of USF at night. Nighttime is something Disney does spectacularly well, and it is something that Universal desperately needed. Go see Cinespec people!!! Now, IoA needs a nighttime show! 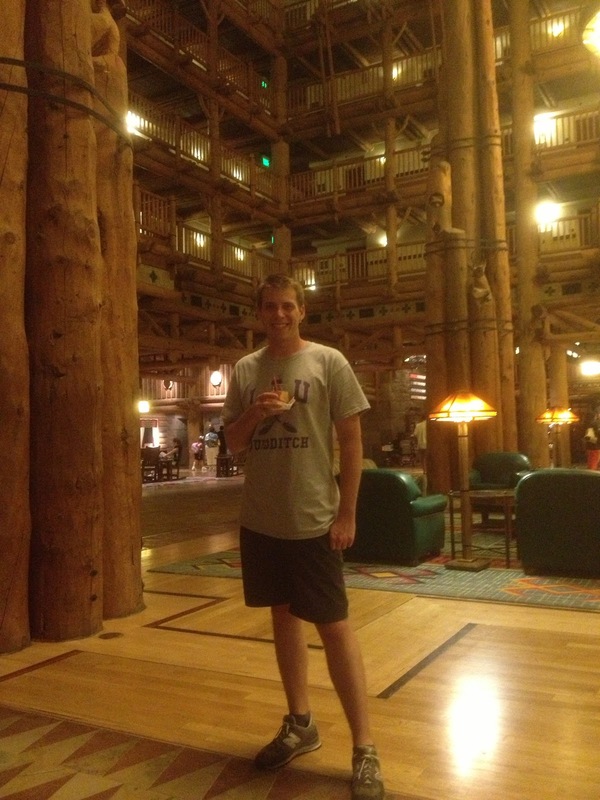 After Universal, I went to Polynesian, bought a Lapu Lapu, and watched HalloWishes for free from the Polynesian beach. I then relaxed for a bit at the boat dock, took the Motor Launch to the Magic Kingdom and then to Grand Floridian. I met some friends in the Citricos bar where we had some very well-made drinks and sang Adventurers Club tunes. It was a fitting end to a great trip. I cannot wait to go back! Some new notice of commencements up today, both of which will affect onstage areas in some way or another. The first is for a new canopy in Toon Lagoon from Sundance Architectural Services. They have worked on small and large projects related to canopies in the theme parks, so it remains to be seen what the end product will be. The second are replacements for Jurassic Park show doors. I have to assume these are the doors at the very beginning of the ride. JP usually goes down for refurb shortly after the holidays, so it's likely that's when the replacement will happen. 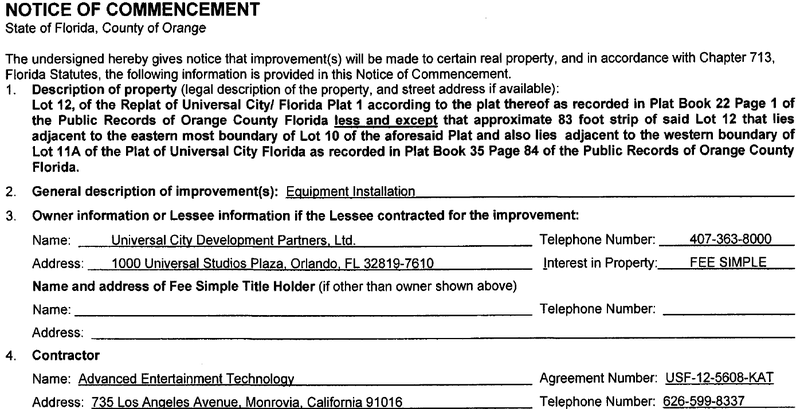 Universal has filed four new building permits this week. 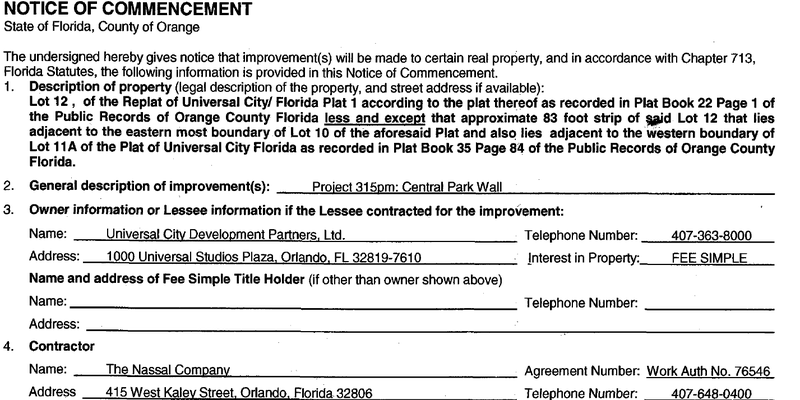 First, they have filed two new permits for the Wizarding World of Harry Potter Phase 2; specifically, they are for Buildings 66 and 64. As you will recall from last week, Building 66 is the Gringotts complex, and Building 64 is Train/Leaky Cauldron complex. We will find out more as they undergo review. Note: these building already have foundation permits and foundation work is underway. These are for other work. 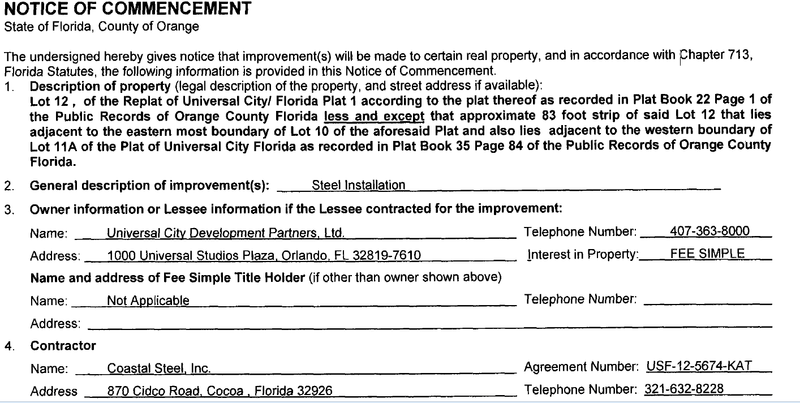 Third, there is a permit for Building 5 which is set to get interior work and a mezzanine installed. 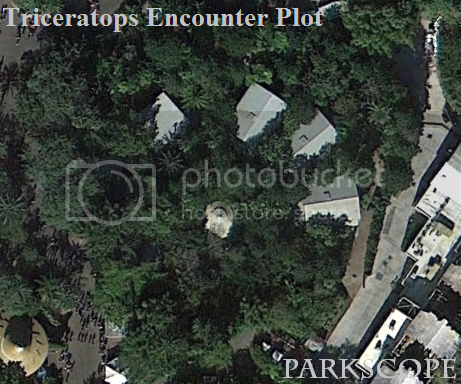 B5 is not on the park map that we have, but this somewhere near the entrance. There was also a Notice of Commencement filed for New Horizons Construction Services to "Install New Games Storage Trailer Behind Men In Black." From all of us at Parkscope, have a happy Thanksgiving, Black Friday, CyberMonday, #PepsiMusicNOW Tuesday, and the newest holiday, Parkscope Wednesday. Universal Orlando really uploaded this to their Facebook page. I have held onto this long enough. Back in July when Lee sent me the plans for the London Waterfront, he also provided me with a numbered building map of the Wizarding World of Harry Potter Diagon Alley expansion. It really does not give anything away unless you look a permits, but now you can know what I am talking about when I mention certain buildings. As you can see, Universal has used 64, 65, and 66 for the three main buildings. They have added letters to divide up the three areas. Here is what we know/think we know. Feel free to fill in the blanks on Twitter, Orlando United, or in our comments. 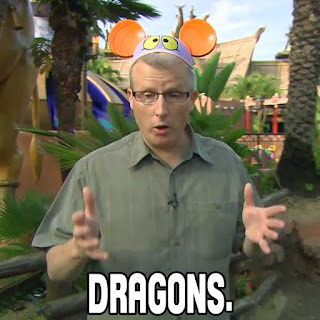 Well, I'm about a week removed from my recent trip to Disneyland resort in Anaheim California, and to be honest, I can't stop thinking and talking about it. Disneyland and the Disneyland resort completely blew away my very high expectations, and that's saying something. Everything they do at Disneyland is the way it should be done. The parks are treated with care and reverence, and they do not cut corners on the small stuff. But enough about all that, you want all the juicy details! I took off from the Philadelphia International Airport around 11:40AM on a Virgin America flight. I need to take a moment to really rave about Virgin America. I flew Virgin Atlantic on my trip to London and Paris in April, and was excited to see if the great service there carried over to the American counterpart. I'm happy to say it does. You don't get the free movies like you do for overseas flights, but you get free satellite TV and unlimited beverages, which is great. I landed at LAX around 2:30 PM, and since I didn't check any bags, I headed straight for the Disneyland Resort Express pickup. Disneyland doesn't have a Magical Express bus, and this is the main mode of transportation to the resort for those not driving. The motor coach only took ten to fifteen minutes to show up, and about ten minutes after that we were on our way to the resort. The ride there wasn't terrible, but I wasn't overly fond of our driver. He was dead set on doing this little comedy routine over the mic that was going over like a lead balloon. But eventually I made it to the Ramada Plaza on Katella Ave, checked in, and grabbed a shower before heading to Disneyland. Now, I wasn't originally supposed to be at Disneyland solo, but my friend and his wife had some family issues at home they had to fly to and take care of, which left me as a solo DLR adventurer. I walked the short distance up Harbor Blvd to the Disneyland resort, and as I passed through security, I couldn't help the huge smile that came across my face. Seeing the Main Street USA Railroad Station was just amazing. This is the park that Walt Disney built, walked through, and enjoyed. That alone made this trip special. Right off the bat I went to the Matterhorn and jumped into the single rider line. Disneyland really uses the single rider approach much better than Walt Disney World, but still not as well as Universal Orlando Resort. Matterhorn was a lot of fun, if not a bit uncomfortable. The bobsleds are definitely awkward to sit in, and could benefit from padding on the seats. But the ride itself is great fun, and I especially enjoyed the snow effect in the first lift hill. From there, I went to see my old friend Mr. Toad. Toad was always a favorite when I was a kid, and I was ecstatic to take that madcap trip through Toad Hall, and to Hell, yet again. What a great attraction. From there I walked around the park a bit before grabbing a plate of jambalaya, cornbread, and a mint julep from the French Market. I grabbed a seat outside and started to chow down, and so began my love affair with Disneyland Resort's quick service food. Such great flavor and ingredients. And to top it off, the jazz band started playing on the stage in front of me! How great! From there, I took in the attractions of New Orleans Square. First up, was Haunted Mansion Holiday, and wow, was this a pleasant surprise. As most of you probably know, the Haunted Mansion in the Magic Kingdom is my favorite attraction there, and I found Phantom Manor to be great, but it just made me want to ride the regular mansion. Not so here. First of all, the exterior and approach to the Mansion here is the best I've seen, and in my opinion, the Florida exterior is the worst I've seen. Walking up to the plantation house is just great. Inside, the portraits, stretch room, and narration was different, but in a nice way for the holidays to be celebrated. I loved some of the new AAs in there like Jack and Oogie Boogie. From there, I went to check out Pirates of the Caribbean. I really like the building it's located in, and awed at the loading area and the bayou at the beginning. Sure, the queue isn't as good as WDW's, but having a great ride easily makes up for that. The caverns and the drops here are really fun, but the Jack Sparrow storyline still is a detriment to the overall experience, in my opinion. Still a fantastic ride. Next, I went to the hub for the fireworks. I'll be honest, I've never been a huge fan of Christmas fireworks, and Believe in Holiday Magic did nothing to change that. I just feel like most holiday songs don't fit fireworks, and the colors usually only consists of red/green/white. Just not my cup of tea, but the crowd enjoyed it. Finally for the night, I went and waited for Fantasmic. Now, I know a lot of people complain about the Fantasmic setup for DHS, but this was no better. You still have to show up an hour early to get a decent seat, and even then you're sitting on the ground rather than benches. But of course, the show completely blows the suffering DHS one out of the water. The use of the Columbia and the Mark Twain really bring a sense of authenticity, and the finale dragon is seriously great. After that, I headed back to the room for a good night's sleep, as I was already dragging from the flight earlier. 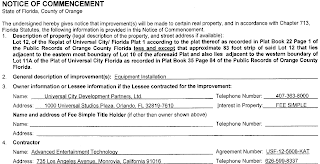 Two new notice of commencents were released to the Orange County Comptroller site today, both of which are for major Universal Orlando projects. The first is for steel installation by Coastal Steel for Project 722, which we all know is the Wizarding World of Harry Potter expansion in Universal Studios Florida. Coastal Steel has been involved with many big projects across the Orlando theme park landscape, including Expedition Everest, Blizzard Beach, Mission: Space's exterior, Astro Orbitor's theming, the Grauman's Chinese Theater facade, and many more great themed projects. The second is for interior finishes by Adirondack. This is for the Transformers ride, as we reported earlier in the attraction's development. Adirondack has also worked extensively in the themed entertainment business. As always, stay tuned to @Parkscope for more information. 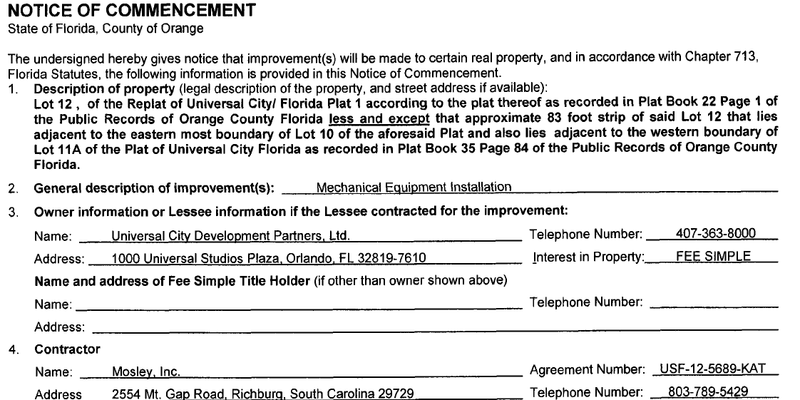 UOR Permit Update 11/14/2012: New Project "Project 007"
UPDATE: The following deals with the Monsters Cafe. Which means we will be seeing the building at least rethemed in the coming months. 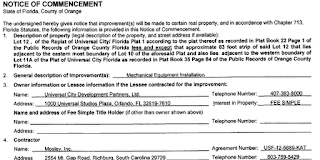 Two new, and interesting permits, have surfaced today regarding Universal Studios Florida that seemingly include even more building remodels. But what is really interesting is the project's name. Now, I have to assume it has nothing to do with Bond at the moment, but still, the on the nose title is curious. 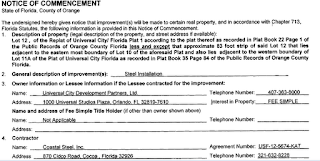 It has to do with interior demolition and foundation work for Building 43 at Universal Studios Florida. Since Transformers was Soundstage/Building 44, we would have to assume 43 would be somewhere around there. The permits can be seen below. Now, again, we're not experts on the building numbers here, but once we get information on the building, we'll make sure to update you here and @Parkscope. 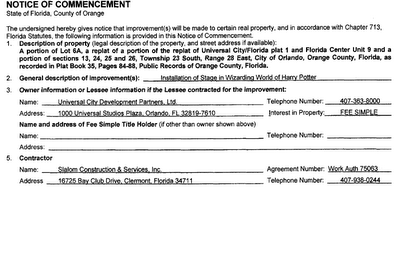 Today, a building permit was filed for the new stage coming to The Wizarding World of Harry Potter. This goes with the notice of commencement filed last month. According to the permit, the new stage will be 2.5 feet off of the ground. On 10/18/2012, Universal Orlando submitted a notice of commencement for a new stage to be built at the Wizarding World of Harry Potter, which can be seen below. One can assume that this will be installed where the Frog Choir and Triwizard Tournament show take place in order to give spectators a better view of said shows. Universal is also adding another "Human Dryer" to Jurassic Park. Stay tuned to @Parkscope and @CaptMichael87 for more details. A few notice of commencements were filed today by Universal. T2:3D is receiving new lighting and HVAC controls, CityWalk's escalators are being refurbed, but the only one standing out is the return of the Donkey and Shrek Meet and Greet. As you can see, it says the Meet and Greet will be moving over to the Shrek Theater. This is an interesting development, as there really isn't any room overall in that building, or next to it now that Transformers is going in. Many have speculated that we may see a smaller, less elaborate area set up for Donkey, similar to the "Waffle Cart" he has in Universal Studios Hollywood. 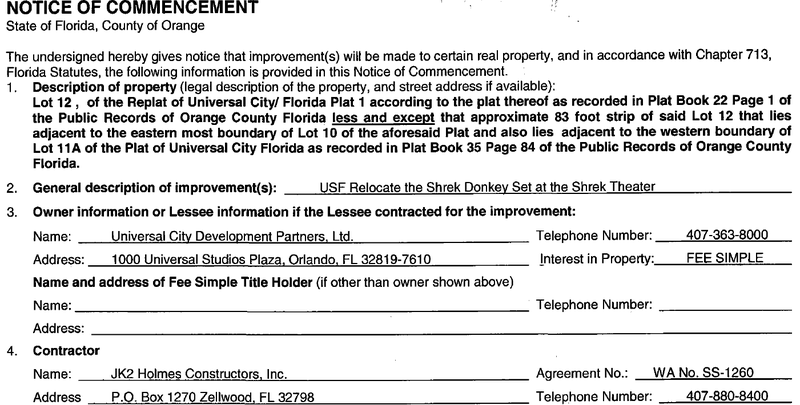 There have also been the beginnings of rumors that Shrek 4-D is not long for this world, so this additions is definitely curious. We'll have to keep our eyes out, and we'll keep you informed as work progresses at @Parkscope. Today's round of Notice of Commencements are another interesting bunch. 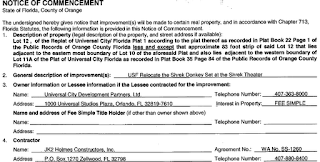 First, the contractor, HW Davis Construction, and Universal Orlando have finally filed notice of commencements for the beginning of the upcoming expanded Simpsons area, filing for construction services as well as demolition and construction walls, both of which can be seen below. 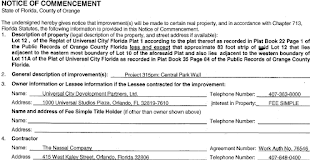 The documents both talk about building 72, which is the International Food Fair, Kwik-E-Mart, and Restrooms that we reported would be partially demolished and changed back in August. For those unfamiliar with HW Davis, they are very well versed in the creation of themed environments for the theme parks. They built the outside portion of the Simpsons Ride, MIB Alien Attack, as well as multiple themed shops and UOR's Orlando International Airport store. Also, a notice of commencement has come from Nassal and Universal Orlando for Wall layout and Installation. Nassal is a company that has done a plethora of work for both the first Wizarding World of Harry Potter as well as design work on the second phase coming to Universal Studios Florida. Could the walls inside the Gringotts ride building be coming soon? Or could they also be working on the interior or exterior theming for Transformers the Ride? Stay tuned to @Parkscope for up to the minute updates on both these continuing projects.